The New York Times bestselling author of The Jane Austen Book Club introduces a middle-class American family, ordinary in every way but one. she was my twin, my funhouse mirror, my whirlwind other half and I loved her as a sister.” As a child, Rosemary never stopped talking. Then, something happened, and Rosemary wrapped herself in silence. 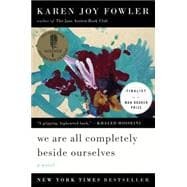 In We Are All Completely beside Ourselves, Karen Joy Fowler weaves her most accomplished work to datea tale of loving but fallible people whose well-intentioned actions lead to heartbreaking consequences. Karen Joy Fowler is the award-winning author of four story collections and five previous novels. She lives in Santa Cruz, California.